MEI will help you choose the best Security Camera setup for your boat. Marine Security Camera systems are almost mandatory now a days. If you really want to protect your belongings invest in a nice Boat Security Camera System. Not only do you get peace of mind while on your vessel but you catch a decent break on your insurance premiums. Marine Electronic Installers specializes in this field and has developed close relationships with the pioneers in this field. GOST a true pioneer in the field has had a little competition lately from Sibell and IC Realtime for reliable marine security cameras. Each one of these companies steadily proves their merits on the high seas. Everyone knows that “a boat is a hole in the water into which you pour money”. GOST or Global Ocean Security Technology has been in the Marine Market for many years. GOST has a few more bells and whistles not pertaining to Security Cameras. Alarms and Sensors for a myriad of common marine application like bilges and live wells. 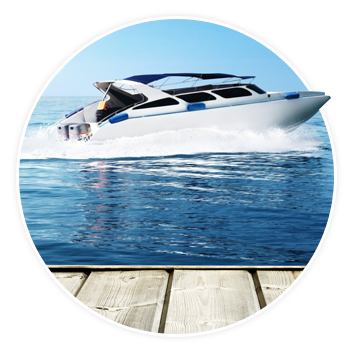 Securing your boat from theft, unauthorized access and sinking are GOST top priorities. The freedom and liberty that your boat provides to your family is now easily secured while on board and from far away. 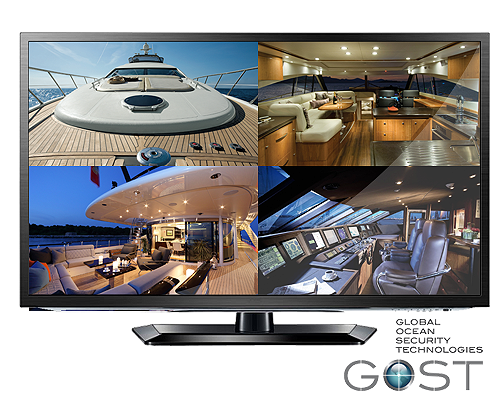 GOST’s marine security and boat monitoring systems are designed with safety and protection as the paramount feature. GPS (Global Positioning System). Global Ocean Security is the most commonly installed marine electronics monitoring device. Bar None... GOST carries only top of the line GPS systems for the whole marine industry. The options and features for Nav-Tracker & GOST Phantom GPS are limitless. Nav-Tracker 2.0 let you stay in constant contact with your boat no matter the location. They use the most dependable and reliable service provided by Inmarsat Isat M2M. Global Ocean Security Technologies (GOST) has many levels of security service they provide depending on your boat or vessel in most cases. In other words no matter the size if you have a small center console boat or an ocean going freighter. MEI can help you determine which GOST system will work best for your application. Size doesn’t matter! So whether you need a Satellite GPS Tracker, Ship Tracking GPS, Fleet GPS Tracker, Yacht Tracking & Alarms, Vessel Tracking & Monitoring Systems, Ship Alarms or Mega Yacht Security - Marine Electronic Installers will help you protect all of your boats. Flats Boat, Dinghy or even a tender let our highly trained and certified marine electronics installers help you protect your belongings. GOST has door contacts, motion sensors, beam sensors along with a myriad of other surveillance industry stalwarts. GOST gives you everything a traditional security system would offer but with many more advanced features pertinent to a marine vessel. 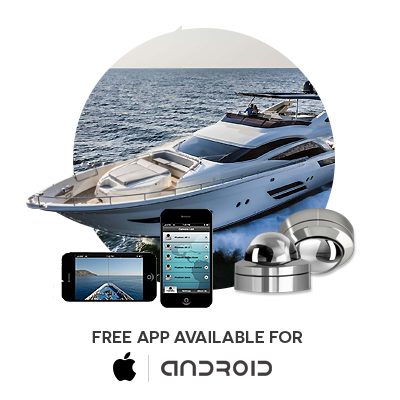 Real-Time GPS Monitoring via GOST Phantom is the ultimate force field for your boat. Vessel Security and Monitoring Systems by GOST have very little if any competition when it comes to providing the finest in wireless security for your boat. These state of the art wireless boat alarms and monitoring systems always comes with GPS vessel satellite tracking and complete internet access. We are local to South Florida! Having a reliable boat security camera is the first step. 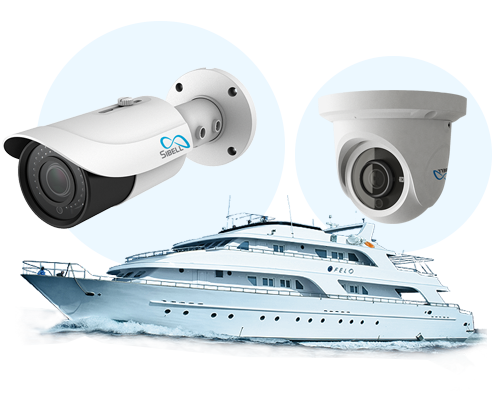 Sibell offers one of the most dependable Boat Security Camera Systems for the marine market. These wonderful extremely high resolution cameras have a boat load of features which places them directly on the medal platform. If the camera doesn’t deter them at first glance rest assured the crystal clear image will be more than enough to lock away the bad guys. It doesn’t matter if it’s pitch black the IR (infrared) capabilities will get every scar and tattoo down to the smile. As the criminals do the felony walk away from your boat, just know it will only be a matter of time before the Grouper Troopers catch them. Sibel has put together multiple packages to meet your needs. The mistake most home / boat owners make is thinking that I don’t need one for my center console. This technology is no longer privy to the elite mega yachts. For a few hundred dollars you can easily protect your dock and boat. Monitoring your boat has never been made easier with built in alerts and functions to notify you of any abnormal activities. These alerts can be sent via email or text message and viewed instantaneously. It doesn’t matter if you are at work, home, or even on the boat. Do you want to know if it’s the pool guy, a squirrel or most importantly the crooks coming for your hard earned goods? Let MEI take the guesswork out of your surveillance system set up. If you’re not familiar with security jargon this can get complicated fast. 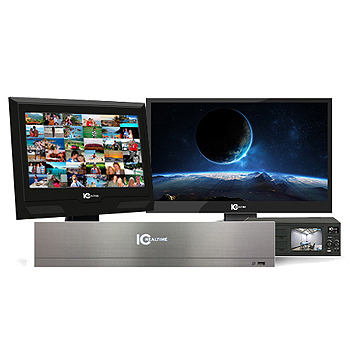 IC Realtime has some great security systems which work well with most like branded accessories. Analog CCTV (Closed Circuit Television) Cameras, DVR (Digital Video Recorders), NVR (Network Video Recorders), IP Cameras (Internet Protocol Cameras), Indoor Touch Panels, Outdoor Camera Stations. Having a Marine Security Camera System in place is paramount to protecting your goods. Also remember to stow away any loose valuables especially when not at your home dock. Great lighting has also been known to deter the best of thieves. One of the most popular and successful theft groups in South Florida History was the notorious “Dinner Set Gang”. They robbed, raided and pillaged waterfront mansions up and down the eastern seaboard. How did they get their name? The majority of these crimes took place while the occupants were enjoying dinner. I’m sure a nice alert while at the dinner table would have been appreciated greatly. The FBI has a track record of hiring the most notorious thieves in history to learn their ways to prevent further mayhem. The Dinner Set Gang dates to the 60’s but as recently as the millennium the FBI is still hiring the most infamous computer hackers in history. Word of advice from the leader of the Dinner Set Gang (courtesy of the History Channel). Two of the most common deterrents for a house they would never rob during a 3 decade span. Drum roll get ready “Outside Lights or Dogs”. Enjoy and don’t forget to check out how we can help you light it up! Fishing equipment is costly and the #1 items swiped off of boats. Right behind fishing poles are your electronics – now this takes a bit more of a sophisticated thief then just grab and run. They must actually cut the cords and back out a few screws to get their treasures. Don’t make it so easy for the thieves to make away with your valuables.